This easy-cheesy Grilled Monterey Chicken is the most delicious combo ever. 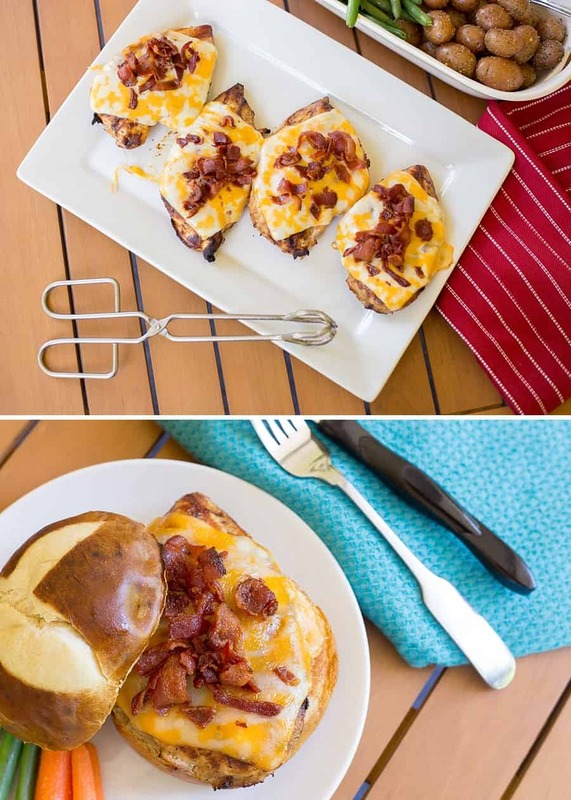 (Cheese + Bacon + BBQ = YES) You’re going to want this on the menu this weekend FOR SURE. 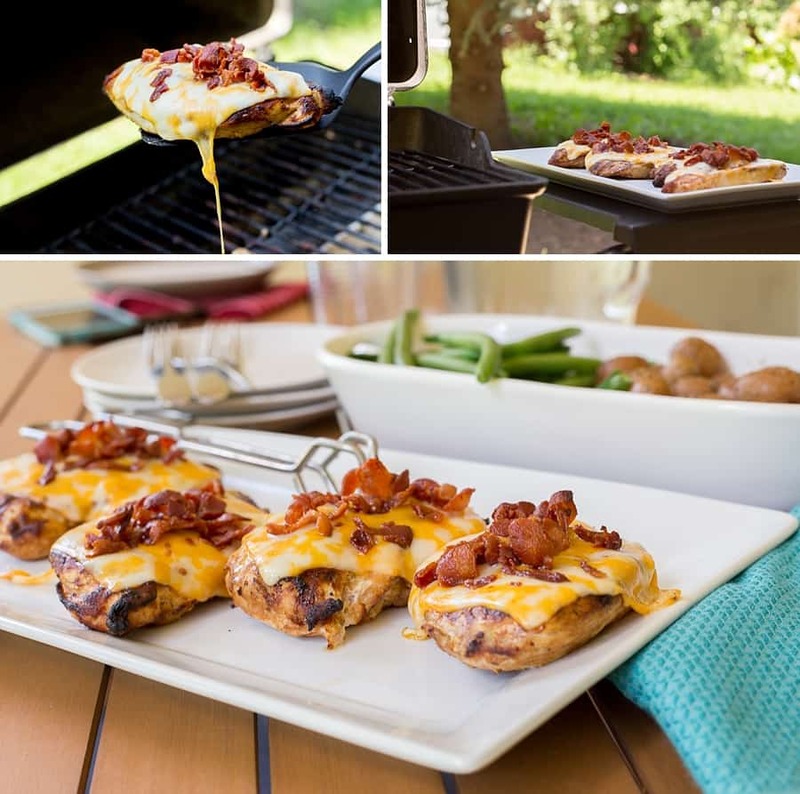 A big thanks to Crystal Farms® for sponsoring this cheesy goodness AND a chance to win a Grilling Prize Pack full of Cuisinart goodies! Pound chicken in gallon-sized Ziploc bag with optional marinade to approximately ½ inch thick. 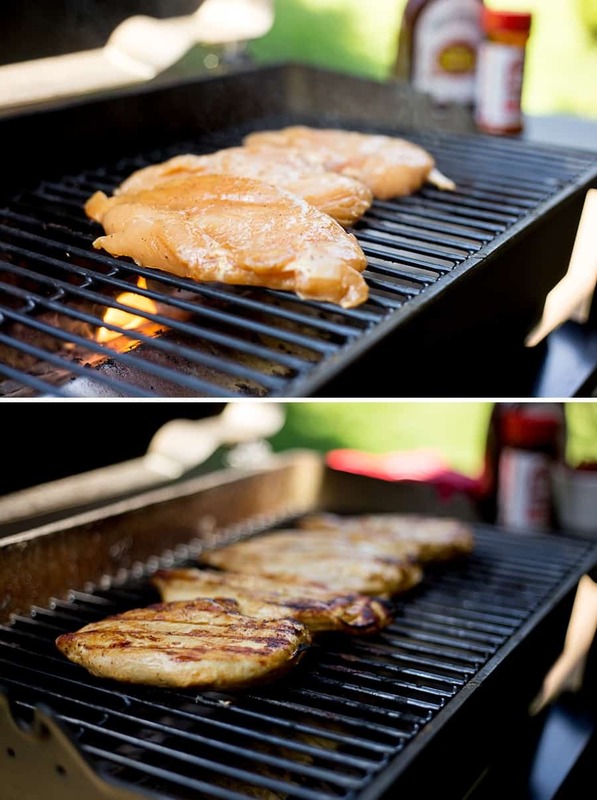 Grill boneless chicken breasts for 6 minutes with lid closed. 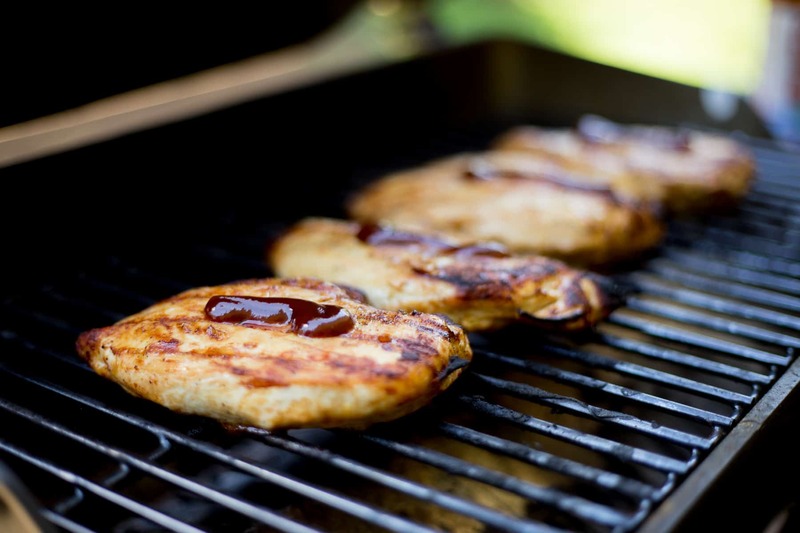 Flip and grill chicken for an additional 4–6 minutes until meat reaches 165 degrees Fahrenheit. Then turn grill temp to low. 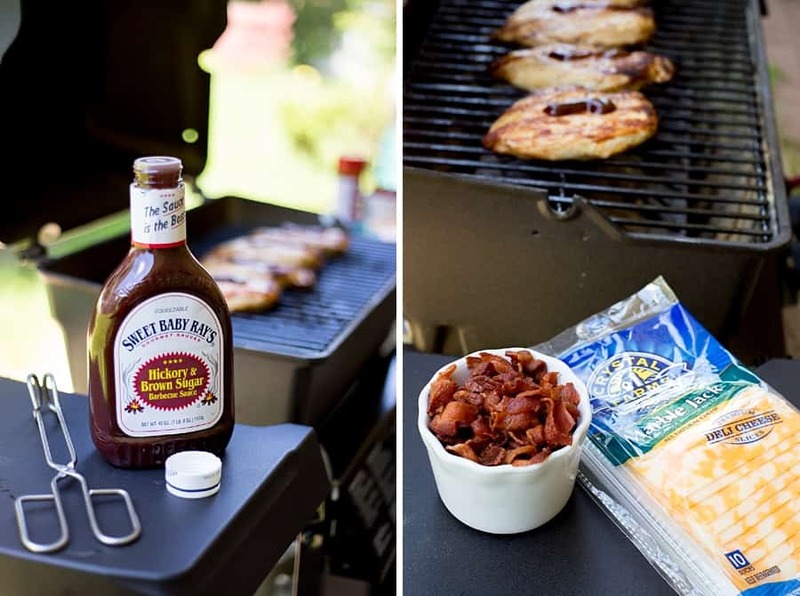 Top each cooked chicken breast with a strip of BBQ sauce, then cover with Crystal Farms® Marble Jack Cheese Slices and cooked bacon crumbles. Close grill lid for 1–2 minutes, until cheese is melted. 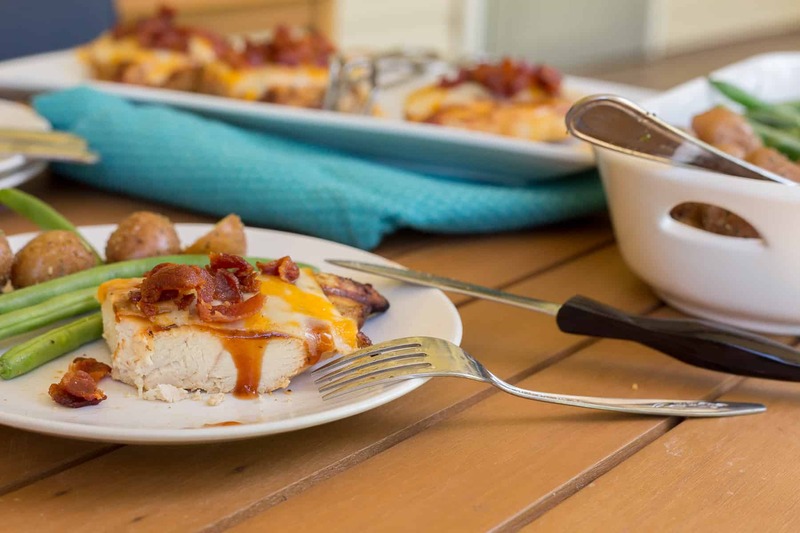 For me, what puts this grilled chicken recipe over the edge is the sweet and tangy surprise of BBQ sauce hiding under the mellow, melted Crystal Farms® Marble Jack Cheese slice. Your family can enjoy this grilled chicken straight up with traditional veggies and potatoes, or the combo is also perfect on a pretzel bun as a sandwich, too. I’m not sure who does the grillin’ at your house, but in our backyard, the grill is my domain. PREHEAT your grill so that it’s super-duper hot by the time you use it. Always POUND your boneless chicken breasts to a uniform thickness to ensure an even cook. Keep the lid closed on your meat, and only FLIP ONCE. When I made this Grilled Monterey Chicken recipe this week, I used a simple marinade (1/2 cup olive oil & vinegar dressing, 3T soy sauce, 1T Worcestershire sauce) in a gallon-sized Ziploc bag as I pounded the chicken to approximately one-half inch thick. If you don’t have these marinade ingredients on hand, just sprinkle some seasoned salt on your chicken breasts. That’s easy and delicious, too. Next, throw your chicken breasts on the preheated grill (smoother-side down). Close the lid and set a timer on your phone for 6 minutes. What I love about this grilled chicken marinade is that when it hits the super-duper-hot grill grate, it will elicit a small burst of flames, giving your chicken breasts great color, a delicious grilled flavor (even from a gas grill), and those fancy-dancy black grill marks. After 6 minutes has passed, flip the chicken. Remember: Only flip the meat ONE TIME. The first step in finalizing your Monterey Chicken is to add a healthy strip of your favorite BBQ sauce to the cooked chicken breast. Now, traditionally Monterey Chicken recipes use honey within the marinade, but I prefer to just use a sweet BBQ sauce instead. 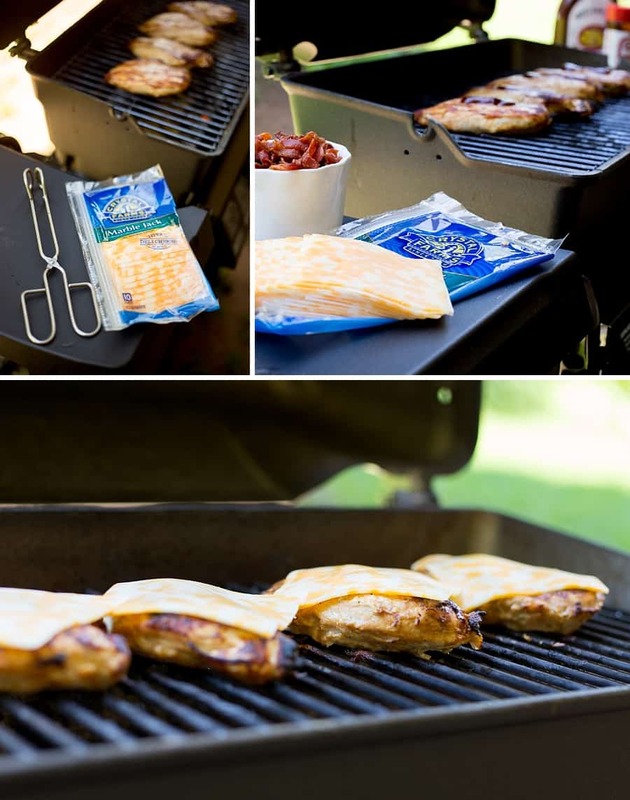 Next, top each BBQ chicken breast with a slice of Crystal Farms® Marble Jack Cheese. It’s a tasty blend of orange Colby and white Monterey Jack cheese. Finally, add the bacon. Liberally sprinkle fresh crumbles over the Crystal Farms® Marble Jack Cheese. Then turn off the grill and close the lid for 1–2 minutes. 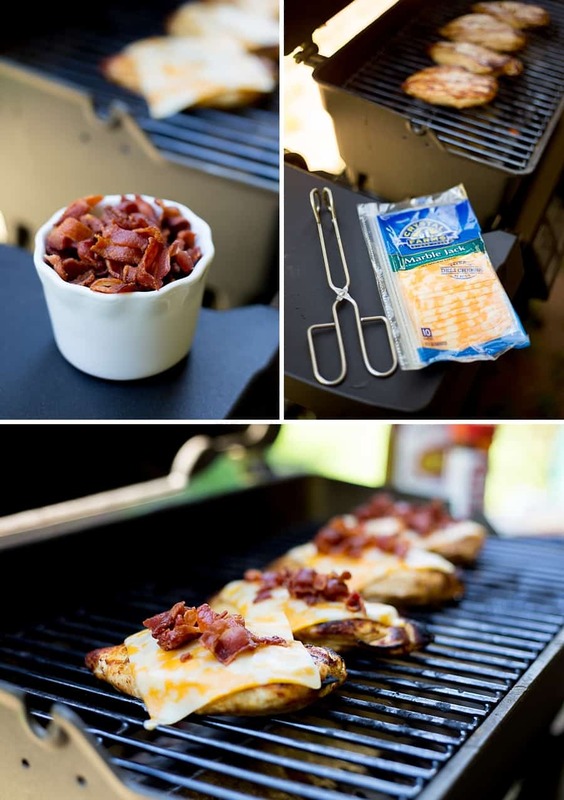 Doesn’t this easy-cheesy chicken recipe sound amazing?!? Here’s the official recipe, if you’d like to print it. How cool is that? Enter below for a chance to win. I know your family is going to love this recipe as much as mine does. If you have any questions about the grilling process or the recipe, let me know in the comments. 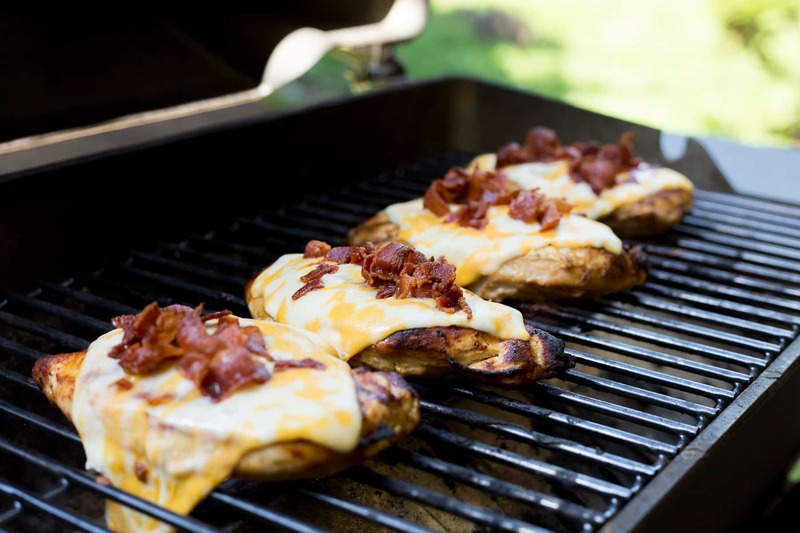 You’ll want this easy-cheesy Grilled Monterey Chicken on the menu this week FOR SURE.